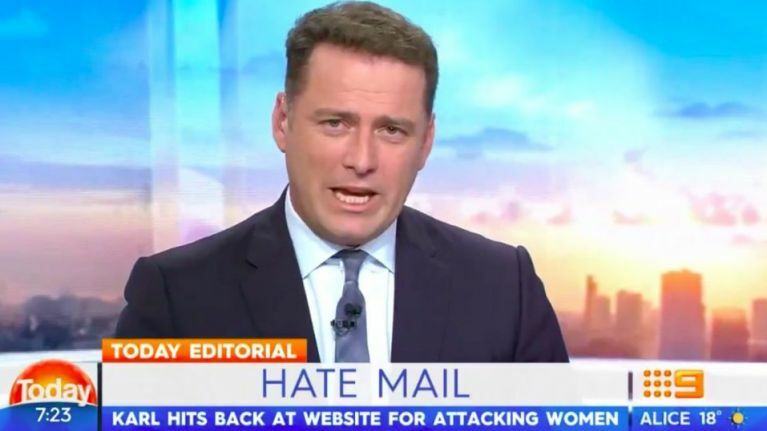 Australian TV host attacks Daily Mail for publishing "cheap, lazy, sexist online slur"
Karl Stefanovic, host of Australia's The Today Show, has launched an eviscerating attack on the Daily Mail after an article it published left one of his colleagues in tears. The article, headlined "Karl Stefanovic checks into humble caravan park with a Channel Nine colleague and 12 cans of pre-mixed rum, but girlfriend in nowhere to be seen", insinuated that Stefanovic was a "drunk" and that he and a young producer were "settling in for a long night", according to the host. In response, Stefanovic spoke out against the Daily Mail, condemning it for "criticising and publicly humiliating people, women especially". The breakfast program host also recounted previous occasions where the Daily Mail had attempted to shame his colleagues for wearing the same clothes and "so-called ‘granny pants’." Stefanovic's personal life has been the subject of major interest in Australia following his separation from his wife of 21 years, something he was apparently willing to accept. "Go hard on me," he said in the video. “Make up your stories. Publish your lies. Send out your paparazzi. "But if you have a sliver of decency, if you have any care whatsoever for the women of Australia, do not slur the reputations of others in your eagerness to throw mud at me."